Why choose 3 Tesla MRI? Must and More is among the first in North Delhi to offer 3T imaging. Must and More diagnostic center have expert staff and modern technology which is setting new standard in medical field. Must and More is equipped with Siemens 3T MRI machine. Tesla (T) is the unit of measurement quantifying the strength of a magnetic field. At Must and More scanners are ten to fifteen times the strength of open MRI scanner and twice the strength of 1.5 Tesla machine. The magnetic field produced by our 3T MRI system yields exceptional anatomic detail. The enhanced image quality obtained from 3T is particularly beneficial for pathological condition including the brain, spine and musculoskeletal system. 3T Scanners have many more benefits. It is not only limited to magnetic Resource imaging. The enhanced spatial resolution of the 3T scanner provides high quality vascular imaging. Thus 3 Tesla MR takes short time and is very efficient. It also maximizes patient comfort without compromising quality. It allows every health care team to provide early diagnosis and treatment. It is very reliable and allows radiologists and doctors to differentiate between small and big medical conditions with ease. By choosing 3T imaging you can opt state of the art facility and modern technology. Insurance companies pay the same amount for an MRI regardless of whether the exam is on a low field or high field magnet. So come to Must and More and relish your worries. Why choose 3T Imaging at Must & More? Must and More have the most powerful 3 Tesla MRI to produce best quality 3T Imaging. We have the most advanced technology in Delhi/NCR. Same day appointment scheduling is also possible. 24 x 7 reporting through TeleRadiology. Sometimes people get uncomfortable or frightened because of the noise produced by the MRI machine. A conventional 3T MRI Scanner generate noise up to 120 dba similar to noise of thunder. To overcome this issue Must & More has installed a unique technology, called silent MRI. 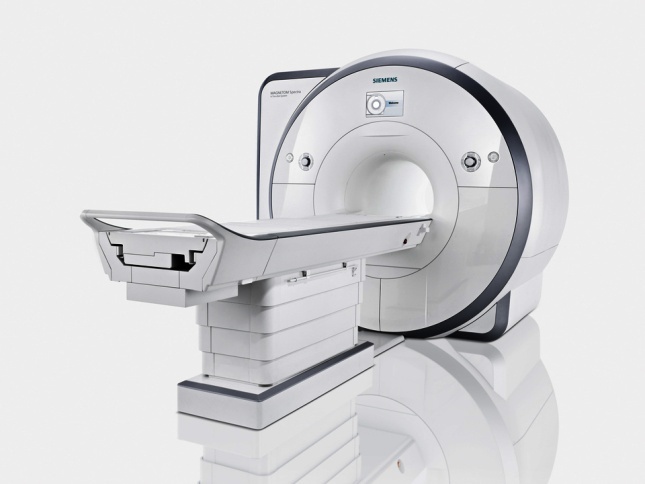 The silent MRI feature produces absolutely no noise during scanning of certain anomalies. Albeit of 70-cm wide bore (tunnel) with bright inner tunnel light and ventilation system the person having claustrophobia is very uncomfortable. At Must & More the new 3T MRI ensures patient comfort and helps them overcome anxiety by quick diagnosis and in house talking system. At Must & More patient's feet will enter the MR tunnel first, thus allowing an unrestricted view of the ambient surroundings. 32 channel Head coil - for simple and perfect neuro imaging. From this technology the most advanced clinical exams like functional imaging of brain (MRI-Including the stimulus and responsive setup - visual auditory, gustatory, tactile motor cognitive etc.) can be performed easily with utmost precision and accuracy. Now the technology is capable of imaging all the major arteries and veins of the body without any injection. This is very useful in patients with peripheral artery disease, varicose veins etc. With MAVRIK the patients having metallic implants can be scanned properly. Mavrik enables to view clearly. Body parts like limbs and organs can be scanned through this process. Advanced neuro 3D COSMIC, Diffusion, Tensor Imaging, Fibertrak, Brain stat (AIF parametric maps), Brain wave real time, brain wave fusion etc. for clinically advanced neuro imaging and accurate assessments. With this technique both qualitative and quantitative information of the fat content in liver can be obtained in a single breath hold. Liver fat content assessment is important for: Non alcoholic fatty liver disease (NAFLD), Alcoholic liver disease (ALD), Surgical Planning donor evaluation and nodule assessment. Brain perfusion assessment is important for neuro development delay (NDD), tumors, stroke/TIA, AVM etc. The DSC perfusion is not always reproducible and provides relative perfusion only. Whole brain, quantitative tissue perfusion, without contrast, is great for the patient and is much simpler than injecting contrast.